Holland’s Got Talent (the Dutch variant of America’s Got Talent) is a TV-show / talent show, in the Netherlands broadcasted by RTL Television. Artists of all sorts demonstrate their talent by performing a wide variety of different acts, to compete and in the end to reach and win the finals. 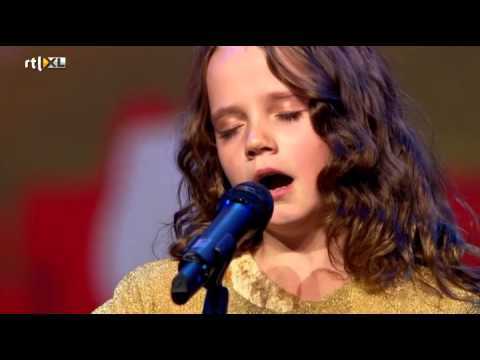 In the season of 2013, the at that time 9-year-old Amira took part in the auditions for the show, which were held in Zwolle among other cities. Below you can see the video of Amira’s smashing performance, where she sings the aria O Mio Babbino Caro from Puccini’s opera Gianni Schicchi, immediately resulting in receiving one of the four Golden Tickets that directly led her to the semi-finals. Her first audition immeditatly becomes the start of a real Amira hype, not only in the Netherlands but also internationally. The performance above was broadcasted in the show’s episode of October 26th 2013, and on YouTube has had more than 20 million views in merely 6 weeks. The expectations for Amira’s performance during the semi-finals of Holland’s Got Talent are high. On December 21st, only a few days before Christmas and during the penultimate episode of Holland’s Got Talent, it’s finally Amira’s turn to shine again. This is going to be exciting because up to 2 days before the show, Amira had to deal with serious vocal problems as the result of a bad cold. During the semi-finals Amira sings the beautiful Ave Maria composed by Johann Sebastian Bach & Charles Gounod. After this overwhelming performance Amira earns -just as expected by her growing number of fans- her place in the finals, which would be broadcast on December 28th. During the finals of Holland’s Got Talent the 8 finalists compete to become the winner. There’s a strong competition between very talented singers and dance-acts. Despite this competition Amira keeps it cool and performs that night with the aria Nessun Dorma from Pucchini’s opera Turandot, which isn’t seldom called one of the most difficult aria’s to sing. With this great performance -and with more than 50% of the TV-viewers’ votes- Amira Willighagen wins Hooland’s Got Talent 2013 at an age of only 9 years old.